When money gets tight and you need a little extra cash, the last thing you should do is take out payday loans or add expenses to your credit cards. Before you do that, did you think to look under your mattress? Did you check your closet for unused items you might be able to sell or rent out? 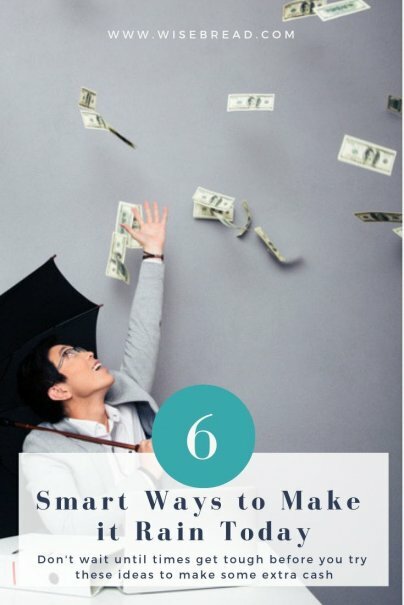 Don't wait until times get tough before you try these six smart ways to make it rain. People use Craigslist to post classified ads of all types, including one-day gigs. Job posters sometimes create ads for gigs in the jobs board, or you could simply search under "gigs." For instance, check under food/bev/hosp and you might find gigs to staff events as servers or hosts. You might even end up with a steady flow of cash from occasionally picking up these temp jobs. If hamming it up in front of the camera is your thing, you could join an agency like Models4TradeShows. This site keeps a database of promo models to hire for ongoing local events. Find one in your area by doing a city search for promo modeling agencies or event staffing recruiters. Get paid to attend the filming of popular daytime TV shows like Beat Bobby Flay, Steve Wilkos, and more. In order to make it rain joining local audiences, you'd obviously have to live in Los Angeles, the Tri-State area, Pennsylvania, or in a region like Atlanta, where these types of shows are filmed and produced. Join TaskRabbit and become a Tasker. This will require you to spend some time creating a profile and being selected for tasks, but it's worth it for well-paying gigs. The company pre-screens it's clients and handles the money transactions for you, so you always know you'll get paid. Sell your unwanted and unused stuff on letgo. And don't worry, it doesn't matter what it is, how old it is, or how worn out or beat up it is. Sellers on letgo are advertising everything from a beat up old pickup trucks, Tickle Me Elmos, and brand new motorcycles. When money is tight for you, how do you earn extra cash? Share with us in the comments!